K’Von Huddleston knew what was at stake when he stepped to the foul line with under a minute to play again Clairton last Thursday. The Union High boys basketball team’s senior standout held in his hands a chance to send the Scotties to the WPIAL Class 1A semifinals. Calmly and cooly, he stepped up, took a breath, and knocked down four shots in the final minute to hold off the Bears and give Union the victory. The feat earned him New Castle News Athlete of the Week honors presented by Washington Centre Physical Therapy and selected by the New Castle News sports staff. Huddleston finished with 12 points in the contest, trailing only Tre Charles who scored 19. 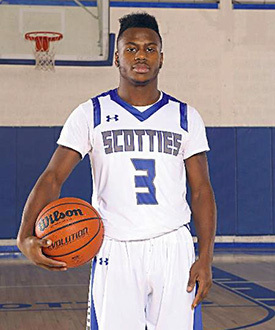 The 5-foot-8 wing player is also one of the Scotties’ best on-ball defenders and a tenacious rebounder despite being what some would would consider undersized while playing in the front court. Huddleston is the third-leading scorer on the team with 8.7 points per game, behind both Charles and Dom Dudo. It’s the intangibles and things that don’t show up on the stat sheet, however, that set him apart. Huddleston said that he tries to model his game after future hall of fame guard Dwyane Wade. Wade is a three-time NBA All-Defensive team selection and one of the best rebounding guards in the league. His selflessness and team-first attitude is something that has caught Stanley’s eye in the past. Stanley added that Huddleston’s work ethic and devotion to the team is something that can be used as an example for younger players. “He’s just such a hard worker. He comes to gym day in and day out and in the summer he was almost always there. That’s not something that you can replace and that’s what you want all your guys to do,” he said. Huddleston’s career on the court for the Scotties is winding down as they near the PIAA playoffs, and he said this year has been as memorable as any of those prior.